Last month we published a guide on how to 3D print your own Astro Pi flight case. Since then we’ve seen some amazing examples pop up over on Twitter. My favorites have to be the two below. @KaceyandKristi posted this amazing rainbow flight case – great way to make the most of the layered design! You’ll never lose Jonny Teague‘s case in the dark! John Chinner‘s neon orange case was made by Ryanteck. PLA (a material often used by 3D printers) comes in all kinds of different colours – LEFRANCOIS has printed his case using a metallic gold, making it a perfect partner for our original aluminium one. Richard Hayler, a Code Club mentor from Surrey, went for classic silver filament for his case. He even used the same buttons as the real units up on the International Space Station. These are fantastic and we’d love to see more of them, but I also have an additional challenge for you – hack our design! Maybe you’d like to add your name to the front, or add an extra handle – surprise us! 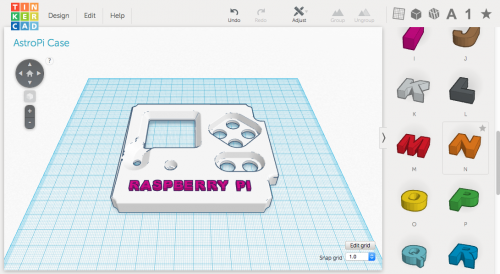 I added the words “Raspberry Pi” to my top layer very quickly in Tinkercad, a simple and free in-browser 3D-modelling program. I also successfully installed FreeCad on my Pi3 today, and I’m going to see what I can do over the UK Bank Holiday weekend. Get your printer on and warming up! Here’s a link to the Astro Pi flight case STL files: go go go! There was also this lovely example at PiParty by Leo White. Oh, yes – I particularly like that one! Since then I’ve actually wired the buttons up! Just need to get around to writing up all the 3D printer related fun I had getting all the parts correct! I do have plans to create and print out a mount for it, maybe add some lettering too. Will you be able to share the files for those of us who want to mill our cases instead of 3D print?